Seventeen… Love Rocks or other little random yarny/sewn gifts. One more this month, although it was actually a case of giving someone else a ball of yarn from my stash because I know how much she would enjoy making something herself. 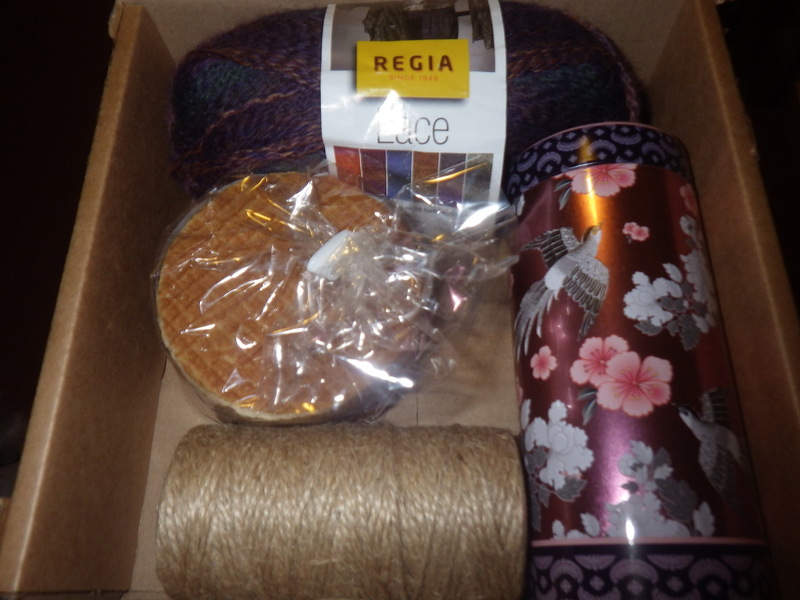 In the parcel I also put tea, biscuits and a ball of string… essentials for a happy crafter! Total 8. Sixteen… batches of homemade biscuits. This goal is complete. Fifteen… cheeses. I didn’t make any this month because of a disruption to the milk supply. The total is currently ten, there will be more next month. Fourteen… pairs of knickers. None this month, so the total is still six. Thirteen… mends. Target reached in May. Twelve… letters to friends. Target reached in June. Eleven… new items in my Etsy shop. None this month. The total is still eight. In fact I’ve sold several things, so I really do need to restock. Ten... plants given to good homes. Target reached in May. Nine… games of Scrabble. Still none yet. 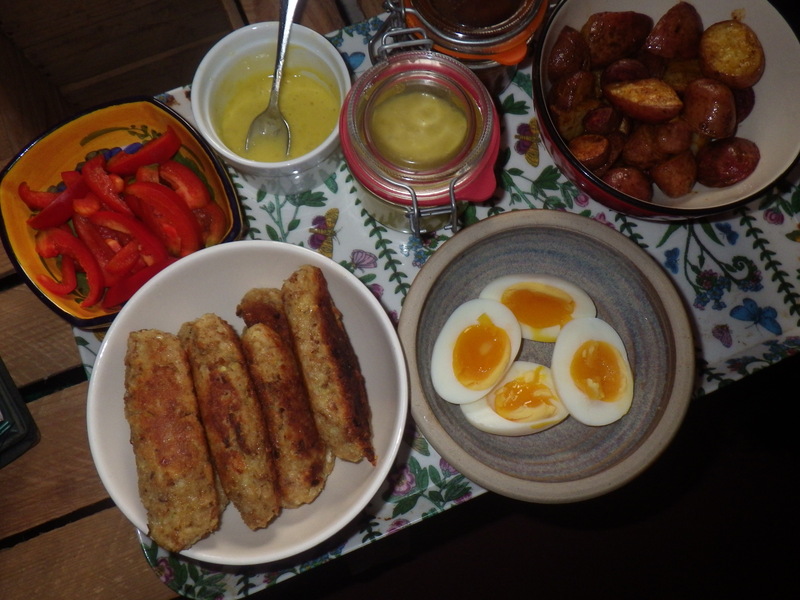 Eight… meals using only our own produce. I have to confess that I have rather lost count of this because so many meals just get made and eaten without really thinking about the source of the ingredients. As a result I also forget to photograph them, so here’s one that’s mostly home-produced. However, I know that there have been at least five this month, which takes the total to seven. Seven… visits to see “social media” friends. None this month, as I had to postpone the one that was planned. The total is, therefore, still six. 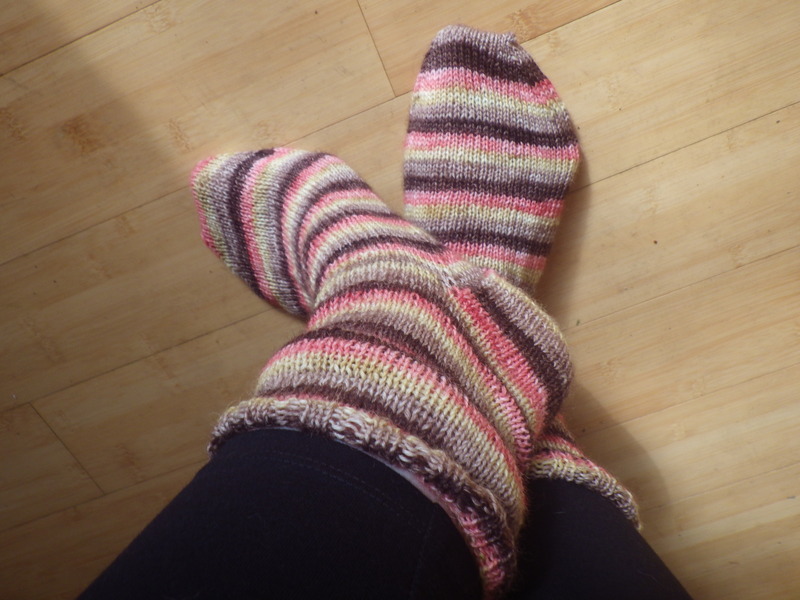 Six… Pairs of socks knitted, using at least three different patterns. This is the biggie this month: two pairs completed using my standard pattern and the first of another pair underway using a very different pattern. So the total is three completed and one in progress. Five… book chapters written. None yet, but some planning has happened for a different book that I’m going to co-author. Four… blankets for charity; knitted or crocheted. Target reached in February. Three… sessions in the loft, sorting out some of the accumulated ‘stuff’ up there. I’ve done a bit more sorting, but it hasn’t really been a concerted effort, so I can still only claim one “session”. Two… patterns published and on sale. No new pattern this month, so just the one published in January. Actually, this was the thing I had planned to do this month and somehow, yet again, it didn’t happen – really because I got distracted by the socks. One… gardening apron. Completed in April. Worn a lot this month! So that’s it for now. If you have a 17 for 2017 blog post or an update on your progress, do leave a link in the comments. My you have been busy and so many goals achieved. Your meal looks delicious. I love the gift you made, yarn, tea, biscuits, but why the string? It looks very nice string, but.. The particular friend it was for really likes string… so I sent her some lovely British-made jute twine to use in her garden. You’re actually doing really well! If I do it next year, I think I will focus on the creative stuff, as it’s helping me to get on with a few things that I’ve previously thought abut, but lacked any particular incentive. I do like a list, so I am enjoying having this big annual set of things to do… seeing my spreadsheet gradually filling up is very satisfying. Onward, ho! Let’s hear it for the creative life. This represents some really impressive achievements. I am beginning to wonder about the scrabble though. Did you have a particular reason for including it? Are the reasons being met by your doing other activities instead? Actually, I have to confess that it was the final thing I added. I couldn’t really think of anything for 9 and then I remembered that we used to enjoy playing Scrabble on a regular basis. I thought that if I listed it, I might be encouraged again… but clearly not. Subsequently I’ve thought of several things I would have preferred to include and I even considered substituting it for something else half way through the year, but decided to leave it there, just in case it inspires me. I think part of the problem is that it isn’t “creative”, which is what really inspires me at the moment. Great that you’ve had at least seven meals made up entirely of your own produce. Such a good feeling when that happens 😊. You’ve accomplished so much, Jan. It’s fun making up lists and goals, then keeping track of your progress. I’m so impressed. This is the first year I’ve done this particular activity, although I am a big fan of lists. I’ve learned quite a lot about what works for me and what is helpful and I think I will do it again next year with a bit more thought in advance. There is something about being outwardly accountable that can be both motivating and encouraging, don’t you think? This time next year, assuming all goes as planned, my youngest son will be heading to college. I’ve been thinking about your cabinet project and think I might come up with a similar idea for my crafting. Right now I use the corner of a desk and the kitchen counter. You’ve prompted lots of thinking over here. From US. What do you mean “knickers”? Are you making them? Sewing, knitting, or ? ?